I really liked this book. I thought that it was very artfully written, with a good mix of drama and suspense. I really liked the characters, and I thought she did a great job at making them come alive. I loved the plot, and just the genre was amazing. I recommend it to anyone who likes a mystery in historical terms. Amid the glamour of Prince Nicholas Esterhazy's court in 18th-century Vienna, murder is afoot. Or so fifteen-year-old Theresa Maria is convinced when her musician father turns up dead on Christmas Eve, his valuable violin missing, and the only clue to his death a strange gold pendant around his neck. 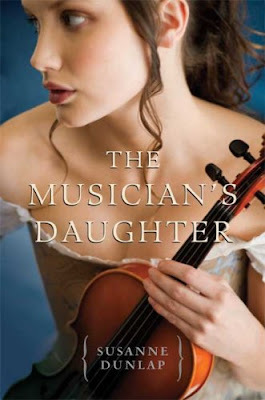 Then her father's mentor, the acclaimed composer Franz Joseph Haydn, helps her through a difficult time by making her his copyist and giving her insight into her father's secret life. It's there that Theresa begins to uncover a trail of blackmail and extortion, even as she discovers honor, and the possibility of a first, tentative love. Thrumming with the weeping strains of violins, as well as danger and deception, this is an engrossing tale of murder, romance, and music that readers will find hard to forget.